This summer the Tate Modern is showing the UK's first ever retrospective of radical Russian artist Kazimir Malevich. If you know the name, you're most likely familiar with the influential, arguably even revolutionary work that is the "Black Square." And even though, in the back of your mind you realize the radical undercurrents of the deceptively simple work, you still may feel the almost uncontrollable urge to blurt out: "Really, though?" 1. We don't blame you. 2. We're here to help. Malevich, born in 1879 and raised in Imperial Russia, witnessed both World War I and the October Revolution in his lifetime. But before you read too much into the artist's socio-political background, remember he's also the man behind Suprematism, the art movement that views art purely in terms of form and aesthetics, rejecting social and political ramifications. So, when we see what looks to the human eye like the simplest of shapes in the simplest of colors, what are we supposed to think? If you're now scratching your head, you are not alone. 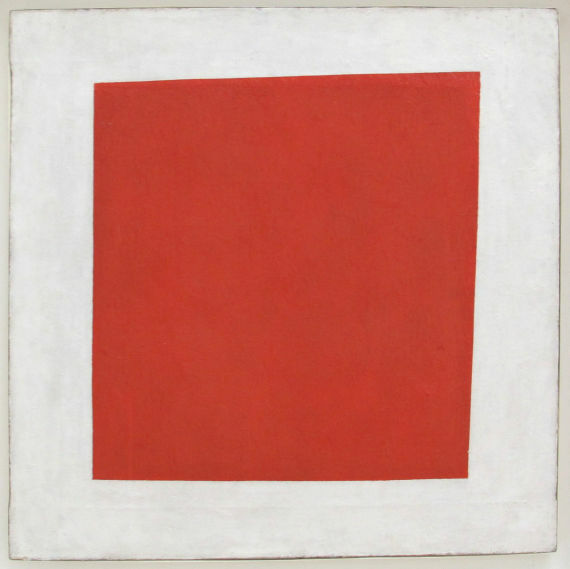 New York Magazine's Jerry Saltz made a likeminded comment pertaining to Malevich's white square, which poses a similar dilemma, in a review of MoMA's "Inventing Abstraction." He explained: "It can take a lifetime to understand not only why Kazimir Malevich's white square on a white ground -- still fissuring, still emitting aesthetic ideas today -- is great art but why it's a painting at all." Now that you know you're in good company in your confusion, we return to the question at hand. What is this pesky black square, the simple shape that consumed Malevich from 1915 until 1929, that he painted over and over again? And why is it so important? What came before the "Black Square," artistically speaking? 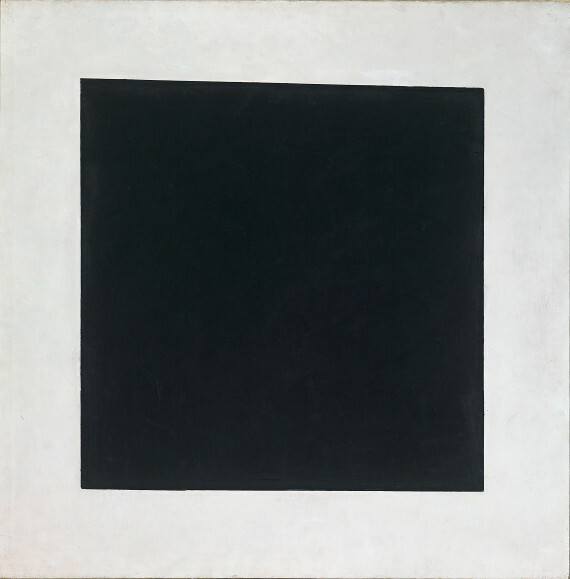 The "Black Square" is most often categorized as a monochrome painting, because -- you guessed it -- it predominantly features a single color, in this case, black. Although Malevich's "Square" is often cited as the major catalyst of the genre that later came to be known as monochrome art, he wasn't the first to take the logic of "all black everything" to the canvas. The earliest documented instance of a monochrome artwork was, in fact, a joke. As Amelia Groom points out in her essay "There's Nothing to See Here: Erasing the Monochrome," the first monochrome canvases were exhibited at an 1882 show titled "Les Arts Incohérents," featuring a short-lived and highly irreverent anti-art movement that would later inspire Dada and surrealism. One of the works on view, created by poet Paul Bilhaud, was titled "Negroes Fighting in a Cellar at Night." For a novice eye, or most any eye for that matter, the painting looks a lot like Malevich's. In 1887, author Alphonse Allais followed suit, titling an all-white monograph "First Communion of Anemic Young Girls in the Snow." Although both Bilhaud and Allais are creating art with a wink that Malevich would later reject, the three artists aren't speaking altogether different languages. It was, after all, Malevich who wrote in his 1915 manifesto, "Only dull and impotent artists screen their work with sincerity. In art there is a need for truth, not sincerity." And while Bilhaud and Allais certainly weren't being sincere, they may have been, even subconsciously, telling the truth. In their monochrome works, Bilhaud and Allais begin to explore the relationship between art and nature, while toying with the space between. While using humor and absurdity as vessels, the artists navigate the murky territory between art as representation and art as something pure in itself -- whether this purity is material (paint, shape) or transcendental (idea, feeling). What came before the "Black Square," historically speaking? Malevich, the oldest of 14 children, was raised by Polish parents who'd both fled to Kiev after the failed Polish January Uprising of 1863. Many critics have debated over whether Malevich's artwork, which is so clearly revolutionary aesthetically speaking, can be thought of in terms of political rebellion. Could Malevich's work be read, for instance, in relation to the October Revolution of 1917, which occurred only two years after Malevich's first square? In his piece "Becoming Revolutionary: On Kazimir Malevich," Boris Groys reminds us that a key facet of revolutionary artwork, or revolutionary anything, is criticizing the current order and then calling for change. But Malevich's work was anything but mimetic, never referencing the current order of things whatsoever. However, as Groys explains, "If Malevich's Black Square was not an active revolutionary gesture in the sense that it criticized the political status quo or advertised a coming revolution, it was revolutionary in a much deeper sense." And here's where things start to get deep. With "Black Square," Malevich doesn't want to start a political revolution: the piece is the revolution. In a world defined by constant change and progression, he aims to destroy all of it at once with a single pictorial "last word" for which there is no rebuttal. "Malevich shows us what it means to be a revolutionary artist. It means joining the universal material flow that destroys all temporary political and aesthetic orders. Here, the goal is not change -- understood as change from an existing, 'bad' order to a new, 'good' order. Rather, revolutionary art abandons all goals -- and enters the non-teleological, potentially infinite process which the artist cannot and does not want to bring to an end." 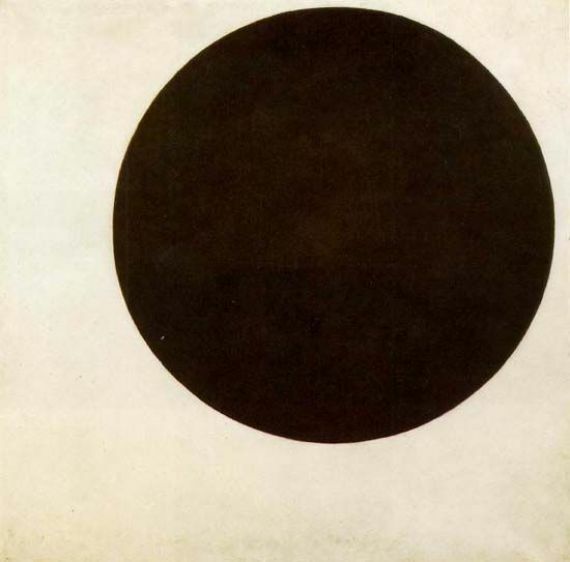 Malevich achieves something in art that history or politics could never achieve. A radically new creation through total destruction. Maybe when we said "total destruction" we were being a little dramatic. That makes the "Black Square" sound like it's made of some otherworldly material of total blackness, rather than, well, paint. Although the uniform application of pigment creates the strange simultaneous feeling of depth and flatness, time has transformed the appearance of the "Black Square," and its meaning along with it. "Time has not been kind to Kasimir Malevich's painting, 'Black Square,'" writes Philip Shaw. "In 1915 when the work was first displayed the surface of the square was pristine and pure; now the black paint has cracked revealing the white ground like mortar in crazy paving." What this unfortunate effect of time reveals is the impossibility of an artwork's idea transcending its material reality. And though there is something sublime about Malevich's pure material object (the square) floating in a void of creation (the empty canvas), it's also still just paint. For Malevich, however, this paint had tremendous power, power not just to represent reality but to create a new reality. As Michael Brenson wrote in a review of Malevich's 1990 retrospective: "He may have been the first abstract painter to demonstrate the inexhaustible potential for meaning in the dialogues between edge and shape, color and texture, restless and silent form." This faith in paint as the stuff of creation and destruction is the very driving force behind Suprematism, or "an attempt through abstract painting to define a new, supreme universal reality." but this essence has always been destroyed by the subject." For Malevich, there is no transcending the paint, not because paint isn't powerful enough, but because paint is so powerful such a thing would be impossible. Red Square: Painterly Realism of a Peasant Woman in Two Dimensions, 1915. What relevant artworks followed "Black Square"? The list of monochrome artworks, clearly somewhat indebted to Malevich's square, goes on and on. There's Yves Klein, who engineered his own tone, International Klein Blue, to adorn his monochromatic canvases. He referred to the work as an "open window to freedom," a means to access an immaterial and utopian realm. Then there's Robert Rauschenberg, whose "White Paintings" will go down in history as inspiring John Cage's silent musical score "4'33"." Rauschenberg also famously created the piece "Erased de Kooning" by, you guessed it, erasing the entirety of a drawing made by New York art star Willem de Kooning. Again, ideas of creation and destruction are brought to the fore. Mark Rothko continued Malevich's quest to channel transcendent feelings through non-representational forms with his emotive Color Field paintings. And Ellsworth Kelly proceeded to give tone and form the utmost respect, not as properties of an image, but as things in themselves. In the artist's words: "Color and shape are constantly in dialogue. As you modulate one, the other reacts." Strangely, however, one of the works most often associated with Malevich's "Black Square" isn't a monochrome artwork at all, or even a painting. Nope, it's "Fountain," a porcelain urinal exhibited proudly and signed R.Mutt in 1917, by art history's favorite prankster, Marcel Duchamp. What do a black square and a rogue toilet have in common? As cultural theorist Slavoj Žižek illuminated, one of Malevich's greatest accomplishments in regards to "Black Square" was asserting that it was art. "The underlying notion of Duchamp's elevation of an everyday common object into a work of art is that being a work of art is not an inherent property of the object. It is the artist himself who, by pre-empting the... object and locating it in a certain place, makes it a work of art -- being a work of art is not a question of 'why' but 'where'." Malevich's square was one of the first artworks to ever make people gasp, guffaw, laugh uncomfortably and assert their five-year-old children could do better. He transformed Bilhaud and Allais' 19th century jokes into something far more dangerous, something serious and true. Malevich was among the first to elevate something seemingly un-art-like to the mystical and elusive realm of Art. That elevation is in itself an artistic act, if not the artistic act, as Žižek calls it: "artistic endeavour at its most elementary." The notion of raising something to the status of art continues to inspire contemporary art-makers to this day. It's the reason a giant balloon dog sold for a cool $58.4 million at auction, or that one of the world's most beloved performance artists is "doing nothing" at her highly anticipated summer exhibition. It may very well be the reason your grandparents hate going to museums anymore. It's the power to take something physical and transform it into something else -- whether it's emotional, immortal or simply way more expensive. That indescribable yet undeniably perceptible alchemy, that is the power of art. Now, give that little square another glance. "Malevich" runs until October 26, 2014 at the Tate Modern in London. For another guide to art that's hard to tackle, check out our Definitive Guide to Reading Abstract Art.